Stepping on higher ground, from where the top-selling Ford F-150 stands in terms of towing and hauling capability or working capability generally, the blue oval brand has to offer a Super Duty line of trucks where belong models from F-250 to F-750. These models are with gross weight rating over the 8,500 lbs and super duty lineup was initially launched for the 1999 model year. 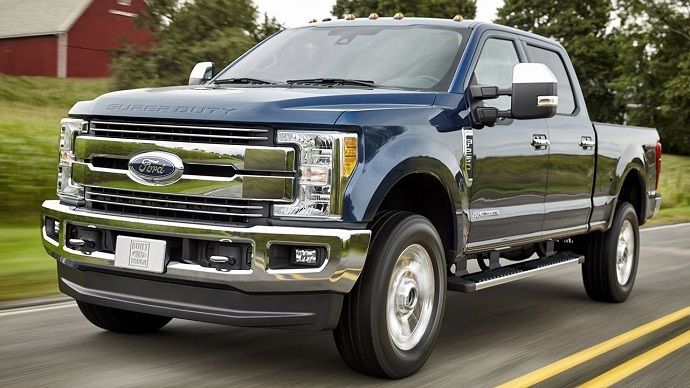 This series of Super Duty trucks feature heavier and more capable mechanical hardware and in same time much higher towing and payload capacities than their recent equivalents from HD (heavy duty) series. Now, after 17 years of existence and two years of the F-150 model redesign, the Super Duty models have been completely redesigned. The 2017 Ford F-250 Super Duty and other versions from this lineup will follow the similar path as the recently redesigned F-150 but this time everything is larger and heavier and also backed with new technology and features. These models are also aluminum bodied, they will also get lighter and stiffer frames, improved driveline components and engines. The interior will also be upgraded and also available with many upscale features. There will be different body configurations and equipment will be organized in five trims. In the engine department, the 2017 Ford F-250 Super Duty will be equipped with the familiar choices. The petrol powered 6.2 liter V-8 engine is now paired with TorqShift-G six-speed automatic gearbox which is the first usage of this shifter with gas engine. The current output of this engine is rated at 385 HP and torque at 405 pound-feet. We expect improved ratings in the new version but Ford hasn’t said in what extent. The same case is with a 6.7 liter Power Stroke V-8 turbocharged engine which now produces 440 HP and 860 lb-ft of torque but before Ford will disclose real numbers some reports claims it will try to attack 1000 lb-ft of torque in the new version. Another engine option is 6.8 liter V-10 gasoline which will be available for chassis cab models. All engines will be available in both rear- and four-wheel drive configurations. Lighter body and construction and engine upgrades should also bring some improvements in the fuel economy but real ratings haven’t been revealed yet. Not much differences with tow ratings despite Ford promises higher values and more confident towing. However some estimations prognoses up to 15,900 pounds when V-8 gasoline is equipped or 14,000 pounds with diesel engine all with conventional trailer setup. On the other hand when equipped with fifth-wheel, diesel engine should max 16,600 pounds. Better towing ability will be also available thanks to the improved driveline, drive system components, upgraded axles and other hardware that is related with towing. Improved is also adaptive front steering which will improve trailer handling and so on. Where, Ford also has pushed boundaries is fully-boxed frame which now comprises over 95 percent military grade steel and as Ford claims it now features 24 times stiffer construction over the outgoing version. Ford also has molded body panels with aluminum and total weight saved with lighter frame and body components is around 350 pounds. The 2017 Ford F-250 Super Duty and rest of this lineup will also bring other improvements and upgrades that are not only related with its mechanic and construction. New models will also promote reworked styling, improved interior and upgraded technology features. The overall exterior look remains blocky and same oversized fender flares are still present but front fascia is well-composed and modernized. The front grille is formed with two bars which are also perforated in some versions and on its each side are quad beam LED headlights with C shaped running lights. The Super duty series also offer roomier cabins that have also been better appointed and equipped. The models feature same dash design and flat rear floor as top-selling F-150 but also offer more in-cab storage solutions. The latest Sync 3 infotainment system includes 8-inch screen and other connectivity and integration compatibility options. Another available feature is camera system which includes up to seven cameras in order to provide all-around view, cargo box view and there is also option for trailer mounted camera. Leather trim, power seats and many more will also be available. The available cab configurations include regular cab models, extended cab or also called Super Cab and the most spacious Crew Cab version. All cab versions are longer for the new model year and regular cab includes two conventional doors, four door Super Cab has rear hinged rear doors while full-size four conventional doors are featured on the Crew Cabs. Cargo beds are expected to remain in two length including 6.8 foot and 8 foot variants. The available equipment will be organized in five trims: XL, XLT, Lariat, King Ranch and Platinum. The base XL trims covers necessary features while slightly pricier XLT grade includes standard chrome grille and bumpers. This trim also covers power locks and mirrors, 18-inch alloys, cruise control, remote keyless entry, a 4.2 inch display and rearview camera. The Lariat trim brings running boards and exterior lights from the outside and inside it adds leather upholstery, leather covered steering wheel, eight-inch screen and Sony entertainment features and power seats as well. More goodies will be available on the King Ranch models including side mirror lights, LED box lighting, illuminated running boards, remote tailgate, power adjustable functionality for pedals and steering wheel, push-button start, navigation with voice activation, and leather bucket seats. More upscale features will be available on the Platinum trimmed models. There will be included 20-inch alloys, power adjustable running boards, LED lighting clusters, heated steering wheel, wood interior accents, massaging seats, adaptive steering, etc. What is also important the super duty models will offer blind spot warning system, lane departure warning, tire pressure monitoring, adaptive cruise control, forward collision mitigation, etc. The new 2017 Ford F-250 Super Duty will come for sale this fall. The similar models that are considered as its main competitors are Ram 2500, Nissan Titan XD, and Chevy Silverado 2500 HD. The base XL models will go for $33,740 while the best equipped Platinum models will be priced from $63,300.